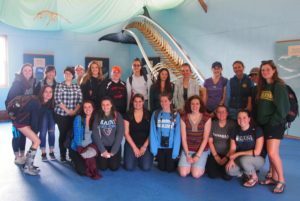 This past weekend, 19 undergraduate students from the University of Maine and Dr. Kristina Cammen traveled aboard the Schoodic Ferry from Bar Harbor to Winter Harbor to check out the Schoodic Center whale museum. 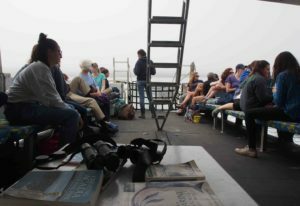 On the way, (amidst the fog) they spotted harbor porpoise and gray seal, several sea birds, and interesting upwelling patterns. The students also had the opportunity to talk with a professional marine mammal observer, and learn about internship opportunities to do the same aboard the scientific data-collecting ferry next summer. Thank you Kaitlyn Mullen and Frenchman Bay Research Boating for a great day on the water!